manufacturer wants to really get started in the eighth largest 3D printing market. Brugg, 2 August 2018 Sintratec’s compact SLS 3D printers are now being sold by the Korean company L.corporation. Among others, the 3D printing specialist from Seongnam, Korea has successfully been distributing FDM and SLA machines from reputable manufacturers for several years. 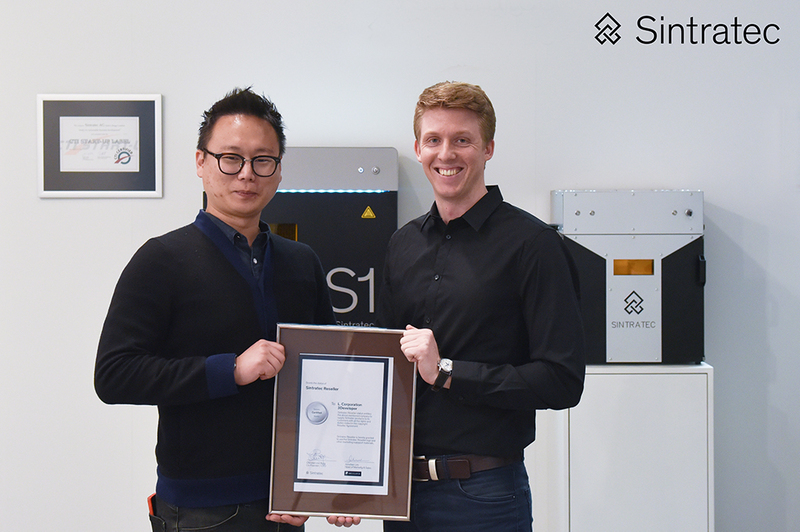 With the Sintratec Kit and the Sintratec S1, L.corporation is now introducing SLS machines into its product portfolio for the first time and intends to develop the SLS market in South Korea newly. “The SLS market in South Korea is still underdeveloped compared to the FDM and SLA markets. In the industrial sector, the SLS market is dominated by EOS. However, the demand for 3D printers in the Korean industry is still below its potential as the necessary skills are lacking. Sintratec’s entry-level models are exactly what they need”, says Junwhan Lim, CEO of L.corporation. “Our compact SLS systems are perfect for the cost-effective entry into SLS technology. The machines are easy to handle, run on regular power and do not require inert gas. With the Sintratec Kit, the self-assembly also familiarizes the user with the complete machine and the SLS technology. And the best part is that the quality of the sintered components is comparable to large, expensive SLS machines”, explains Christian von Burg, CTO at Sintratec. Sintratec is Switzerland’s leading 3D printer manufacturer and specialized in the development and production of SLS 3D printers. The range includes compact laser sintering systems which process high quality polymers. Sintratec’s laser sintering technology allows the production of complex and freeform objects which meet demanding part resolution, robustness and temperature standards. Many hundreds of professional Sintratec machines are in operation around the world in various industries, universities and research institutes. L.corporation Co., Ltd. was incorporated in April 2015 as a subsidiary of Mirae Int’l Trading Co., Ltd. Founded in 1987 in South Korea. 3DEVELOPER is a brand name of L.corporation Co., Ltd. focused entirely on 3D printers and have broad range of customers in industry, education, art, etc. We offer customers well-known 3D printers and materials with high quality, training, printing service and platform services. Netflix, Amazon Prime Video—Are Taking Video Streaming To A New Level?